The board ran J 2 9 7 8 , giving Boyd a straight and his second WSOP bracelet. Boyd also took the first-place money of $234,065. Meinders capped an impressive showing with a runner-up finish that earned him $144,650. The river blanked and Minnullin’s pocket jacks sent Domenico to the rail in 5th place, for which he earned $43,117. Parmann was the favorite but on the flop Meinder took the lead and never lost it. It came Q 5 10 , pairing Meinder. The board finished with a 2 turn and 8 river, and Parmann was gone in 4th, taking $62,769 with him. With that, there were three players left. The board finished, bringing no help to Minnullin and he was gone in 3rd place, earning $93,892. Brian Meinders entered the heads up match with former bracelet winner Dutch Boyd holding a 2-1 chip lead. 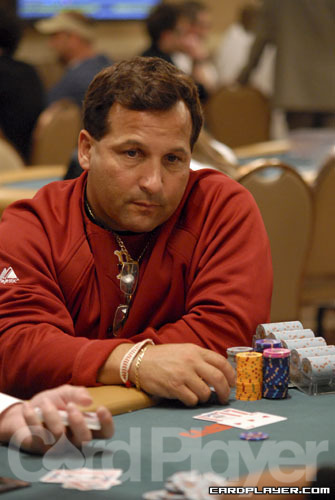 Al Barbieri entered the final day as chip leader. He left as the first victim of the final table. Facing a pre-flop raise by Dutch Boyd, Barbieri put the remainder of his small stack all in and was called by by Boyd and Brian Meinders. On a flop of 9 7 4 Meinders checked to Boyd who bet. Meinders then check-raised, and Boyd re-raised again. Meinders put yet another raise in, building a massive pot and Boyd called. Meinders took down the big pot and saw his stack pass the 1 million mark, expanding his chip lead. Barbieri was gone in 6th place, taking $30,399. The remaining 6 players are on dinner break. Dutch Boyd, the only WSOP bracelet winner at the final table, will enter the break as chip leader, with 745,000 in chips. The first elimination of the final 6 will take $30,399, while the winner gets $234,065. Stay tuned to CardPlayer.com to see who will take the event down. The final day of event No. 23 ($2,500 Limit Hold’em Six Handed) will begin at 3 p.m.
Only a dozen of the 384 players who entered will be back, including chip leader Al Barbieri, Dutch Boyd, and JJ Liu. The remaining players are guaranteed at least $12,382 in prize money, with the winner taking $234,065 and that piece of jewelry that everyone wants. Stay tuned to CardPlayer.com for updates.